the Valley and eventually all over LA. middle of the night on the streets of Panorama City. 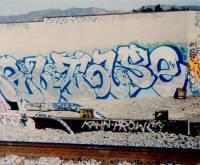 ANGER CBS, JER UFK, ELSE ICR, KRES STP, HEX and OMEGA, etc. divided us for a minute. (IFK). But something always brought him back to the projects of the Valley. bomber, climber, writer, racker, and friend as the stories make him out to be. in the head and killed in San Fernando in late 1998.
even to be crossed out next to TOLSE.